Somewhere along the line I heard that this Saturdays weather was going to be fine so in my mind an out door tidy up was in store. We live in a terrace town house with a stairs to the basement where G has his practice. New word - I usually refer to it as an office. It began to look a bit scraggy in the summer and I kept saying to G, you have to sort it out. I always clear it and expect him to maintain it especially as he walks through it to get to his desk. My dream job of recent years is to clear front gardens, I don't want to plant things I just want to tidy them up. When ever I see something that could do with a sweep, I think, why don't I? For some reason there is more green in the brick work than ever before and as I was tugging some weeds out the dream job was beginning to fade a little. So I think we need to get the jet washer out and go over the stone and lift the slim and muck then put some concrete mix down in the brick joints. I've cleared up by the front door and some of the cement flooring is loose and the water is just pouring through the gaps in the stone steps. More jobs and I can't think if it is best to tackle them as soon as (if) we get another good weekend or wait till next summer when everything is completely dry and tackle it then. But what state will it all be in 2013. Today is grey but as it was G's turn to do breakfast for the girls I went for it and trimmed my bush in the back garden. It's blurry because the button didn't like my gardening gloves. I planted five lavender herbs (not found with the normal lavenders in the garden center) and whilst the bees have loved hanging out here, at nearly six years the growth is beyond a bush. In fact this is it trimmed down from last weeks harvest. It's just got really woody. Alan (80 yrs plus) two doors down said Ken (100yrs plus) would say, trim them when the flowers die leaving and inch or so of green and then trim and shape again when the warm weather arrives but before it starts to flower. The plan is to re plant just two and keep them manageable. Of course by removing them I've made the biggest litter box for all those F****** cats that insist on crapping in my garden so I've decided to fox them by making what I hope will look like a death trap from the leaves of the other big thing that grows. Doesn't it look sad when you pile it all up before the frost. I had a really good sweep, folded the chairs and put away the tools. I will try and get out and do a little bit more through the week. The more gentle stuff will need covering with bark chippings to protect them and plants will need cutting back as the last things finish flowering. The washing line will need rolling up and the pots I will move next to the house out of the wind. By my breakfast time and before my bladder gave out I had two huge sacks and the old kitchen bin. So ready for a shower. But this beauty puts my efforts to shame. It's truly stunning and I would have loved to have sniffed it as much as seen it. Going to fill this week with things to be done. We bought these 'Put Put' steam boats at the GDSF. There was ONE beautifully styled stall filled with tin buckets, gypsy peddlers and twinkle lights (not to mention unwashed hair and long mucky finger nails eeugghh!) in scorching sunshine with all these little boats in water making their way round vintage model light houses etc. G bought 2 and had the girls names written on them. G who is for the most part function over style decided an old tin bucket wasn't cutting the mustard, went out and bought plastic guttering and erected a water viaduct. When P was asleep, T and G spent a chilly two hours in the garden fixing, setting up and watching these boats make their way round the course. Some one also has new shoes. Having to check all bags before leaving nice shops that sell lovely things. There is a chill in the air, I have put the Autumn blanket on the bed and it feels nice. The cat is not sure why I have shut the bedroom window she still likes to sit on the ledge after midnight and scratches at the rubber bit that holds in the glass until I get up and open it. Anyway it is to be wet tomorrow so I harvested most of the dry lavender. The house smells a bit medicinal. I noticed T's ear was a bit red in the week, she said it was fine. Later I thought it was dirty. It appears she had a clash with someones head in the playground. You should see it now that it has had some arnica cream on it. The resolution for this academic year is too keep the dining room table clear so that T can do her home work without being bothered by a mountain of crap. I am keeping it clear but I am up and down those stairs like a yo yo trying to make sure that everything goes away, I supposes that is what must happen if you don't want piles of stuff everywhere? So as P doesn't have a preschool to go to this year and I don't want to put her into one of the many local nursery's I have decided to home preschool until she is old enough to attend the closest one to us which is joined onto the school that T goes to. The children there have to be four in the September and she isn't four until the December so will have to wait until 2013 to attend for one year before she starts school proper, although the admissions told me that they might takes her early, next summer depending on child numbers. So I decided to make a 3D nature table where I could focus the learning and I will probably follow the seasons. Last week we found our tree on a walk, thank you very much Ma Stumbletrip for your sharp eye. G poured post mix in the pot for me and it is ready to go. The box holds work that T has from school, thank you FMH and the basket holds what ever toys I select for P, this week it's a Noah's Ark, brightly coloured eggs and threading animal beads. We've been focusing on pairs and groups of colour. I baby sat last night! Some of my oldest friends will say "REALLY, you?" I thought I'd start some Christmas knitting for G, well, I must have cast on 6 times, not happy, at one point I got 20 rows done and then pulled it back. Got going again but looking at my work this morning I am still not happy and will start again. Is it the wool or is it me? I think it's the needles. P had some trouble sleeping the other night. This is her threading beads on our bed around 11:30 pm. No great drama all very peaceful until G wanted to get into bed and disrupt the craft. Off to make dinner and get the washing in. 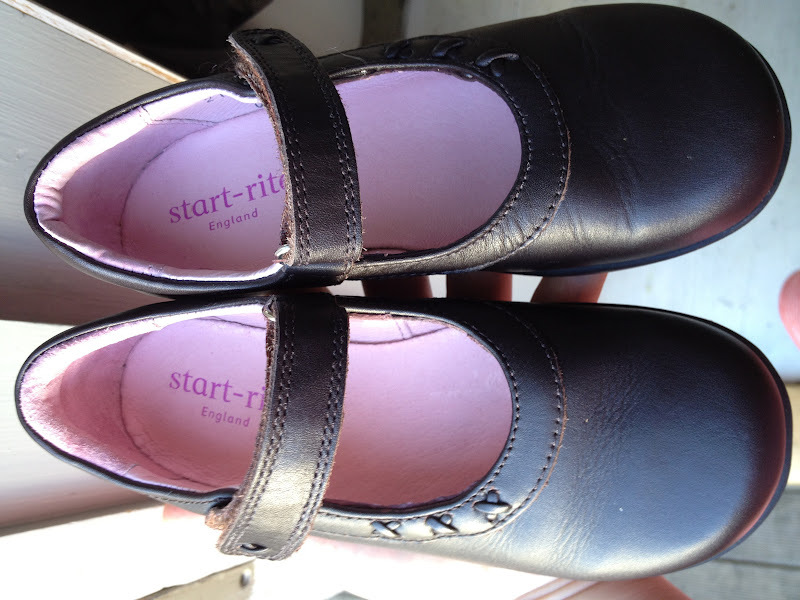 T has to wear brown school shoes and there is only one shop in town that sells them. 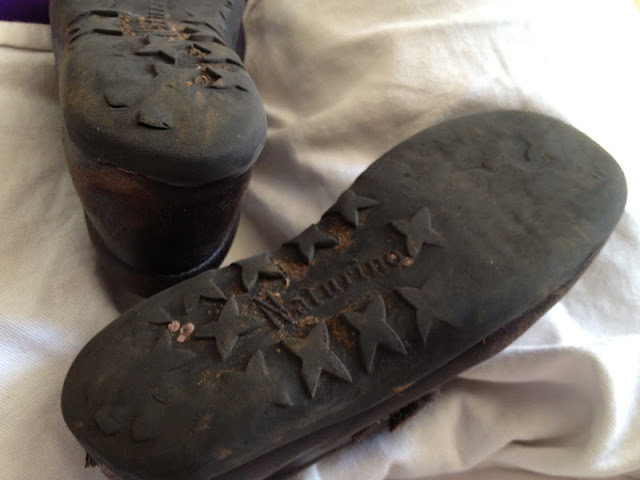 For her Reception year the shop sold me a beautiful pair with stars on the bottom. With four weeks to go in the summer she had pretty much grown out of them but she assured me that it was ok, I didn't need to buy another pair to see the year out. God bless those Italians and their choice of leathers because these shoes grew with her. Anyway we went back to get the same pair but they've stopped that style which is really rather annoying because the metal loop that holds the cross strap is located lower than the edge of the leather so there is some protection against 'diggin in' but in the replacement shoe the metal loop is at the end of the leather which has caused some irritation on T's over sized chunky toddler foot shape. The pink inner is I feel some consolation in this matter and being 5 means it's all about the pretty. Can you see the metal loop? All about the details people. I on the other hand wear my shoes out from the inside, always have. A few years ago I bought a pair of leather shoes in one of those discount stores and no matter how much I wore these pumps they always made my fat feet look nearly elegant. They seem to hold their shape better and they looked nicer on the inside than other really cheap pairs I've owned. So a couple of years ago I bought a leather sandal in the sale with a view to wearing them and no other through the summer and chucking them in the Autumn when they had well and truly had it. Only buy leather and only own what I need. The leather meant that I couldn't kill them despite what I tried to put them through. I managed to loose a big chunk of beads at the science fair and finally I thew them away this week! Mission accomplished, only wore these for weeks and no guilt at putting them in the bin. I felt a little sad! So the theory is to buy next years pair in this years sale so at a reduction of over £140 this box arrived in the post. I also bought a pair of shoes for now and in the Spring. It is better to try shoes on. But I HATE shopping and visiting more than one shop especially in the sale so I went online. It would have saved me making the following mistakes if I had made the effort. The Beaded sandals were CARVELA, love this brand, made for the more mature lady me thinks who wants a bit of comfort over fashion. How amazing that they have them in my size I order a 40, I am a 39? I never got that wrong before. I am going to wear them with skirts and 3/4 length trousers in Autumn and Spring. I own neither skirts or 3/4 length trousers of any kind. They appear a little lower cut than the description on line. I am going to buy a blue rinse, a grey nylon skirt and a lawn bowls set. These are next years sandals. If I had trouble getting my foot in last years pair, these are going to take some hiking socks before spring is out. My mum says they are narrow and I should consider ordering a bigger size. I tell her when did anything ordered one size up get bigger it just gets longer and anyway, I did that already by again ordering a 40. They are tight but everything I ever ever bought has always managed to work it's way loose and baggy I am sure it will be the same with these and they are Italian so I have faith that it will be fine. Lets just hope I don't trip over the length and break the other ankle. Into the cupboard they go until next year. Got out an old Nina Simone album whilst typing finding it very difficult not to sing or cry or both. Such history with her. Well a week after T went back to school we had a final camp for 2012. Earlier in the spring we had booked two pitches at the Herstmonceux Observatory Science Fair for us and a family, the Fords, that we camp with most years. Best weekend ever and this is an incredibly long post about it. A world record length posting, get a cuppa. We picked T up from school and headed out East. The sun was glorious and as the traffic was a bit heavy the journey took a little longer and the roundabouts meant that T needed one of the many vomit bags collected by those friends of ours who took air travel this summer. We arrived with enough time to erect the tent and the Friday night camp spaghetti was made by Mother F and my girls ate everything. The sky was going to be clear which meant great star gazing for G, as far as I was concerned that meant it was likely to be freezing in the night. All of us went into the Observatory later in the evening and spent until 10 having a go on all the exhibits. Due to the nature of the event it meant red light conditions, non of us had got this organised yet so I am amazed that we didn't break a limb wandering around what is mostly a multi level concrete building. Can you see this video it's my first one on here? I think G and T got to look in a telescope I just felt like I walked round with worse vision than usual and then P threw a strop so it was time for bed. So with the threat of clear skies I prepared as best as I could to keep my little family warm with blankets and hot water bottles and failed miserably. 01:45 G came to bed now with a red light from the gift shop and offered me his warm sleeping bag rather than the blanket affair I had sorted. 02:45 I woke and realised it was only and hour on and it was even colder. 04:29 T woke me up in whispering rage, she had in fact been right, she wanted my sleeping bag and air bed because it was better than the one she had been allocated under protest. I wasn't going to argue and jumped at the chance of her far superior bag which fitted me like a tight dress. 05:15 P woke up saying that she was cold and climbed into my sleeping bag that was now in a complete twist, the feet correct and the hood covering my face and I was no longer on the air bed. By morning the whole camp was talking about the cold except T who slept later than she has ever done in 5 years and P got over it pretty quickly. It was like a Jane Austin production. Welcome to the Science Fair, those who arrived early by car were greeted by the naked preschooler. I don't think that there could have been more than 50 tents and they were all on the front lawn. At 7 a java bus came and the air was filled with AROMA of coffee. It was amazing. Why can't I drink this stuff? As soon as bladders were emptied the sun was high enough in the sky to make it sweltering and there was still the opportunity to view the moon, which is P's favourite. Can you see the moon, it's center left in the blue bit? It's got to be the best picture of the moon ever, surely? I made a great breakfast and the children played with their lanyards turning them into leads for their toy animals. Then when events kicked off at 10 up they all went to play. I zipped the tent and attempted to have a shower in a small bucket. I felt better afterwards but looked just as crumpled as when I went in. You can imagine there are all sorts of things to keep young minds entertained. For adults there is all this too and a machine where you press the button and if you release it on 10 seconds a buzzer goes off. Well, it's a competition about who can get the closest to 10, let me tell you had there been power near the tent we would have walked out with it and played all night. Some of us weren't tall enough to get the ball to fly above the hoover. No worries there are other uses. We headed back to camp with the children, G and Papa F went to hear a talk on Supernova's. I think they struggled to keep up and rewarded themselves with another red light from the gift shop. Mother F and I found a shady tree and nattered for a while before the family Olympic themed science show in the afternoon that G and T got involved in, racing to put a skeleton jigsaw up on a wall and P sat and cheered whilst eating ice cream and then much more play in the Discovery Park. Hot dogs for dinner followed by an early night for the children, who were both wrapped up in the warm sleeping bags. Still took them along time to drop off. They lay there so still and quiet but their eyes were wide from what appeared to be a little hyperactivity still left in the brain. Mother F and I headed back into the Observatory to experience something. The queues were toooo long for the big telescopes, which look like this during the day. Along the front balcony the enthusiasts line their smaller telescopes and we asked a gentleman if we could see what he sees. He is a cross between Patric Moore and David Bellamy. He gave a us a pair of binoculars to look through as showed us stuff, stars the look like upside down coat hangers, green lasers that travel as far as the eye can see but have to be turned off when planes are traveling over head and through his telescope M81 and M82, 58000 light years away. But the simplest of all was the Plough. Have you seen it? people talk about it all the time and you see those sickly scenes in rom coms where the guy shows the love interest the stars and I stick my finger down my throat. Well not any more. I finally get what all the fuss is about. This is a photo from Google images. When some one shows you it and it is there with no other distractions it is beautiful and as clear as a sentence on a piece of paper. 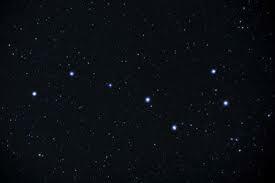 Did you know that the star second in from the left is in fact two stars and they are called Mizar and Alcor. We came out on a high and I wanted a green laser. That night I made a woolen blanket enclosure that kept G and I toasty and with 2 full hot water bottles we did alright but it may have not been quite as cold. Did I mention that I forgot to pack nappies and that became an tiny issue at about 5 am. The smell of coffee wafted through camp Sunday, again the sun was up and it was roasting before we knew it. The ticket also gave us entry to the neighbours garden. and Chestnut trees from the 1700's that remind me of the Friday night twist in my sleeping bag. Actually T hadn't gotten the Amethyst key charm she had being longing for in the gift shop despite her lovely behaviour so she was struggling not to be a brat and required a long talk about gift shops and "I want" on the nature trail back to camp. She did eventually come round and leave the swings early and 'help' us make a snack before we all went off to see the Planetarium which was probably the weakest of the exhibits, mainly due to the blurriness of the projections. It was an inflatable planetarium, think giant black tagine with the same temperature inside. You can't vacate back through the door when the show is in session it is better to crawl out underneath which is exactly what I did when P announced, I need a wee. She then found a new friend who she called her robot and didn't let go of his hand and he spoke to her in his robot voice she was smitten. More play in the park and I got a vac form for the hall in pink. After lunch I took T back into the center and quickly showed her Dome E where there is a rising observation floor and then we talked to each other on the whispering stations and then she built a rocket. Stick a nose cone on it and some fin things. Prepare to launch and pull the lever. I asked T if she wanted me to photograph or film, film, and it is too long to show but it does shoot out of it's docking station reach a great height and land on the other side of the hedge. I wish I hadn't because she returns her safety goggles and makes her way to the exit, sees that her route is blocked turns on her ballet pumps, runs past the lever and jumps clear over the chain. Complete glee for her and a top 5 memory for me. We walk back to camp which is close to being all packed up into cars and there is no shade anywhere. G takes T to the gift shop where an Amethyst key ring is purchased, I take the kitchen gazebo down and photograph P in a nearly empty site. The girls are asleep before the first round about and luckily when we get home are happy to just have cereals for dinner. Best weekend ever and now it's all cleaned and upstairs ready to be neatly backed into the roof space I am officially really ready for Autumn. Promise never to have a long post like that again.